CNIB seeing beyond vision loss | Clarke Office Concepts Ltd.
As animals enthusiasts in general and smitten dog lovers, we have always been deeply moved by the bond that exists between the dog and its owner – the complete trust and working together. Please join us in our quest to raise donations that will go specifically toward the training of a guide dog. Every 12 minutes, someone in Canada begins to lose their eyesight. But did you know that 75 per cent of vision loss can be prevented? For many people who are blind, a guide dog provides an unparalleled level of mobility, freedom and confidence. 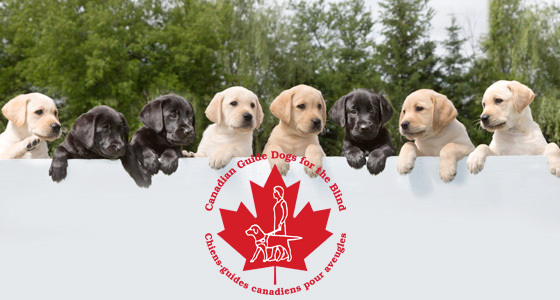 CNIB believes everyone who aspires to use a guide dog as a mobility aid should have the opportunity to do so. Please make a donation to our page and help us help CNIB and Canadians in our community see beyond vision loss. Click here to donate.